S&P 500 gained 13% for the quarter, recovering most of the December dip. We review the state of various sectors with an overview of our portfolio companies. With this retrospective, we share what we learned and how we are implementing changes to become better investors. In contrast to the end of 2018, 2019 has brought new life into the markets. The S&P 500 has gained 13% for the quarter, recovering over 90% of the December dip and now sitting just about 3% off of all-time highs. Earning season will be kicking off in mid-April. Current expectations are showing year-over-year revenue growth of 4.8% with a contraction in earnings, a -3.9% year-over-year change. 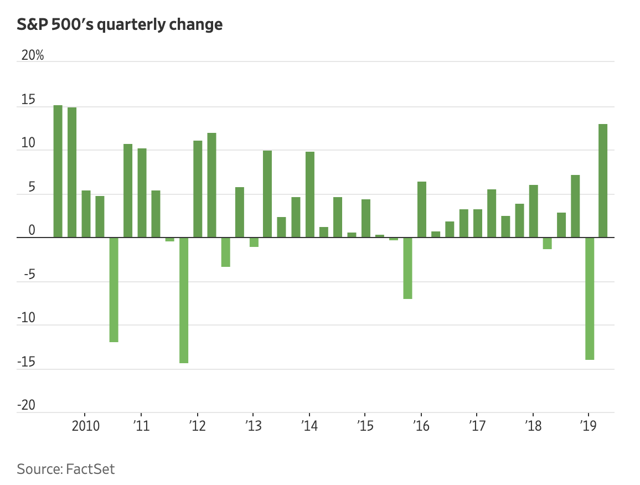 Normally a red flag, the negative growth can be primarily attributed to the step jump in earnings last year due to the tax reform. Notwithstanding the tax bump, full year 2019 earnings and revenue are expected to continue growing, at 3.7% and 4.9% respectively. Torre Financial accounts returned an average of 19.96%. We held our positions through the Q4 dip, and our portfolio companies performed well in the recovery. In this Q1 review we’ll take a look into various sectors, reviewing our portfolio companies and how they are set up for 2019. The year started off with a bang. Within the first week of January, two of our largest holdings were acquired within the first 2 weeks of January. On January 2nd, Bristol-Myers Squibb announced the acquisition of Celgene (CELG) for a total consideration of $102.43, compared to CELG's recent price range of ~$70. On January 2nd, DXC Technology announced the acquisition of Luxoft (LXFT) at $59 in cash per share, causing the stock to jump over 80% in the day. The Luxoft deal is expected to close by the summer, while the Celgene deal is expected to close by the end of the year. Torre Financial accounts had significant positions in both of these companies. The Shanghai index fell 24.6% last year. It looks like the trend may be reversed in 2019. Chinese stocks have begun moving up in anticipation of trade deal. The Shanghai index is up over 20%. All of our picks here focus on growth opportunities in China. Our holdings include JD.com (JD), Alibaba (BABA), and ZTO Express (ZTO). We've recently began adding Baozun (BZUN), a strong e-commerce play in China. Throughout Q3 and Q4 we noticed that semiconductor stocks were being unjustifiably sold off. We believe this industry is instrumental to the future. Our picks in this category have performed excellently. Broadcom (AVGO), Lam Research (LRCX), Skyworks Solutions (SWKS), and Applied Materials (AMAT) have all moved up nicely off the lows we bought into. Anticipation of the China-US deal is likely a positive force here. We’re holding our positions. The healthcare sector is under siege. Opioid lawsuits pose threats to a wide array of players in different subsectors, from pharmaceuticals to distributors. Jeff Bezos, Jamie Dimon, and Warren Buffet seek to disrupt established practices with Haven, their joint venture. Politicians constantly push their agendas with new proposals to regulate drug pricing. And for others, company specific situations like patent expirations lead to uncertainty. Amidst all the noise, we currently find healthcare to be one of the most promising sectors, for the compelling valuation opportunities combined with the defensive nature and long term prospects of the industry. We'll continue to hold Celgene (CELG), Abbvie (ABBV), Johnson and Johnson (JNJ), and Walgreen's (WBA). During this quarter we have added CVS (CVS) and Quest Diagnostics (DGX). Pfizer (PFE) and Merck (MRK) have performed excellently - we may trim to valuation concerns. Energy has been enjoying rising prices, with WTI reaching over $60/bbl. This will fare well for our Permian picks - Diamondback Energy (FANG) and Parsley Energy (PE). We did, however, cut one Permian producer, Centennial Development (CDEV) - we simply find PE and FANG to be superior companies. We have recently been building positions in a refinery, Marathon Petroleum (MPC), which tends benefits from lower oil. We have five energy infrastructure partnerships in our portfolios - Viper Energy (VNOM), Antero Midstream (AM), Oasis Midstream Partners (OMP), Equitrans Midstream Partners (EQM), and Pembina (PBA). Last year VNOM switched from a Master Limited Partnership to a Corporation, simplifying their structure and tax situation for shareholders. This year AM did the same. For the time being OMP and EQM will continue issuing K1's at tax time. We continue to hold all 5 infrastructure companies. We find them to be a combination of attractive valuation, strong growth potential, and high-yield income. At the end of Q1, the yield curve inverted. It wasn't the typical benchmark (2-10 year spread), but rather the 3 month-10 year that inverted. We'll keep a close eye on any potential issues. For now, we are holding our picks in financials, which include JP Morgan (JPM), Bank of America (BAC), Wells Fargo (WFC), Bank OZK (OZK), and Signature Bank (SBNY). We see opportunity for +20% annual returns in most of these names. The industrial sector has faced some headwinds centered on concerns over the global economy. We are confident in and continue to hold our high-quality companies, including Illinois Tools Works (ITW) and Snap-on (SNA). We’ve taken advantage of recent weakness to build positions in 3M (MMM), Raytheon (RTN), and Fedex (FDX). Although Fedex is particularly vulnerable to changes in the economy, we find the exceptional track record, compelling valuation, and potential growth attractive for our investment horizon. Consumer staples is traditionally considered a defensive sector. We're holding our positions with Hershey's (HSY), Procter & Gamble (PG), Pepsi (PEP), and Kimberley-Clark (KMB). These are well known-names in consumer goods. While food producers have had a difficult couple of years due to a variety of headwinds, we have seen signals that may be turning. We've started acquiring shares of J.M. Smucker (SJM) and General Mills (GIS). The attractive valuation, defensive nature, consistent earnings, and high-yield make these attractive companies. REITs, with sizable dividends and grounded in physical assets, offer stability in times of volatility. We've found data center providers to be an attractive niche showing promising growth. In this field, we're holding our positions in QTS (QTS), CoreSite Realty (COR), and Cyprus One (CONE). In other sub-sectors, we continue holding Stag Industrial (STAG) and EPR Properties (EPR), each providing a welcomed monthly dividend. We've cut Realty Income (O), one of the highest quality REITs due to excessive valuation. We've begun adding Iron Mountain (IRM), a high quality REIT focused on document management and digitalization. IRM provides very sticky services, boasting the majority of the Fortune 500 companies as clients. With the recent volatility in 2018, we’ve come to value stability for the peace of mind of our clients. While we previously focused on concentrating investments in the most attractively valued opportunities, we have come to learn that the potential can take a long time to realize. Maintaining conviction against the current for an indeterminate timeframe is challenging. An investor must work hard to protect themselves from becoming emotional attached and overcommitting capital. Take Bank OZK as an example. We believe OZK to be a fantastic company with an astounding track record and compelling future growth. In January of 2017, it traded north of $55. We began accumulating in 2018 as it dropped to the 40's and then 30's. It was trading at a PE of 9, when the average historical PE ratio is nearly 16. OZK has averaged an annual earnings growth rate of over 17.5% and was now sporting a dividend over 3%. Combined with future prospects, OZK was a high conviction pick for us. As the market would have it, by December 2018, OZK traded at around $21. This performance was a drag on accounts, as many held sizable positions. While I continue to view OZK as a conviction pick today, especially as the price action begins to turn, there is a lesson to be learned. We must respect and listen to the market. Deeply undervalued opportunities tend to be so for a reason and negative sentiment can linger. A high quality-company will inevitably turn - but when, and at what cost? In efforts to learn from our experiences we've shifted our allocation strategy. We’ve added more portfolio companies during this quarter with only 3 cuts and over 8 additions. This is part of a larger shift in strategy leaning towards greater diversification. In general, portfolio sizes have increased from roughly 25 positions to 35. All portfolios have been diversified such that no one position exceeds 5% of the portfolio value. For comparison, last year we had conviction picks reaching concentration levels of over 15%. Overweight positions can cause strain on portfolios. Regardless of how special opportunity may be, we will respect this constraint. We have also placed a new found importance on sector diversification. In the past we have forgone certain sectors, for example, utilities due to their lower growth rates, concentrating on growth and value opportunities like financials. With sector rotations, this can lead to unnecessary volatility. By maintaining a more balanced approach we will add another level of stability to our accounts. We continually search for the best investment opportunities. We are still very much attracted to deep undervalued companies, especially those that operate at a high caliber. We will now be more disciplined and patient. Instead of building full positions within weeks or months, we will look to build out these positions over a year. We will more closely monitor the company's progress looking for positive stimuli and wait for an appropriate entry. CVS is a great current example. We’ll be looking for successful indications of integrating Aetna, progress in paying down their debt, and monitor for a change of sentiment. Emotions can lead to mistakes. We seek to remove emotions from our investment equation as much as possible.